Paige received her Doctorate of Physical Therapy from the University of Washington and began working for MTI Physical Therapy in 2012. 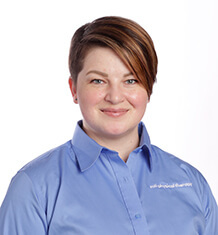 She completed her post-doctoral residency training in orthopaedic manual therapy through the Ola Grimsby Institute in January of 2014, and is currently working towards the Fellowship certification. Paige began dancing at the age of three, and studied ballet and jazz at Studio One under Marius Zirra and Becky Eatinger in Idaho Falls for 15 years. She participated in the company’s annual children’s ballets as both a member of the corps de ballet and a soloist, including several performances of the Nutcracker with the Idaho Falls Symphony. She has also studied modern, African, tap, flamenco, and belly dance to round out her education. A hip injury ended her hopes of a ballet career, but Paige was able to transfer over to ballroom dance, joining the Hillcrest High School ballroom team, as well as the Latin formation team for the Idaho Dancesport Academy (now the Idaho Ballroom Academy) under the direction of Shawn Fisher. Her high school team competed and placed second nationally with their Standard formation routine, and the Idaho Dancesport Academy placed second nationally for their Latin formation routine (choreographed by Jean-Marc Genereux and France Mousseaux) in Provo, UT. The Idaho Dancesport Academy then competed internationally at the Blackpool Dance Festival in Blackpool, England, where they also placed second. Paige continued to study ballroom and ballet while attending the University of Utah, where she majored in Exercise Physiology and minored in Chemistry and Spanish. After college, Paige attended the Utah College of Massage Therapy, where she graduated from the Professional Program and Master Bodyworker Program. She is certified under the National Certification Board for Therapeutic Massage and Bodywork. She is also certified as a Structural Integrator (a form of myofascial release) through Structural Bodyworks with Jason Prince. She utilized her massage training while she worked at the University of Utah Orthopaedic Center as both a massage therapist and a physical therapy aide from 2007-2009. In her spare time, she volunteered her services at several athletic events, including the Bike MS Utah, the Utah Ragnar Relay, and the 2008 National Arm Wrestling Championships. She continues to practice and expand her proficiency in Structural Integration, Craniosacral therapy, and Russian Sports Massage. Paige is also a certified provider of Sole Supports, a line of orthotics designed to improve the biomechanics of the feet. With her diverse background, Paige will often utilize multiple disciplines to tailor her treatments based on each patient’s needs, ability, and activity level. She aims to help her patients not only return to their prior level of performance, but works to help them participate in their chosen activity while they heal. In addition to physical therapy and her studies, Paige continues to pursue her interests in cooking, barefoot running, yoga, weight lifting, Pilates, boxing, and dance.